We joined the Sea Princess at Montego Bay after a holiday in Jamaica at the Sandals Royal Caribbean. Information about this pre cruise holiday can be found by clicking on the appropiate menu on the left hand side. We had booked later than normal but had managed to obtain an inside wheelchair friendly cabin, C305. This had plenty of room to move around once we had one of the chairs removed. Storage was ample with all draws and cabin fridge accessible. The dresser had easy access and the mirror was the right height. The wardrobe did have a low rail but the cabin safe was not really accessible from a wheelchair. The en-suite bathroom provided plenty of hand rails, wheel in hand shower and seat and good access to the wash basin. However, the toilet seat was low and a wheelchair transfer was not easy. The cabin steward provided a number of solutions which indicated to us that Princess had a good selection of aids on board but unfortunately not a Monkey pole (over the bed trapeze), Wendy settled for a 4 inch seat riser and help when required. We found a number of areas not accessible to a wheelchair, these were the adults only pool and spas at the stern of the Riviera deck (deck12), all of the sun deck (deck 15) with its splash pool and Topsails bar, and deck 14 in front of the Horizon Court at the bow. This was a considerably greater area than we have encountered on other cruise ships we have been on. 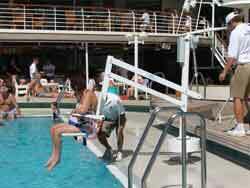 However the Sea Princess did have pool hoists for use in the main pool and one of the spa pools. Wendy used both of these excellent devices but a drawback was you had to request these to be positioned by the crew and passengers were not allowed to operate them. Once you had finished with them, they were removed until required the next time. Public wheelchair accessible toilets were available in several convenient areas. We found life on board slightly less formal than on a P&O cruise. The service and food was excellent and the entertainment good. We didn’t much like the system of tipping and we definitely did not like the 3 percent surcharge levied on your ships bill if you used your sterling credit card to settle your account. I paid with US$ travellers cheques which did work out cheaper. Nevertheless we enjoyed the cruise and were able to go ashore at all ports of call although we never went on any of the ships organized tours. We didn't find the ship's tour desk very helpful and Caribbean transport is not the most wheelchair friendly so we made all our own arrangements, sharing a taxi with friends when going further a field from the dockside. A two hour taxi tour costs about US$100 at most of the islands visited. Our comments on the ports of call are summarized below. 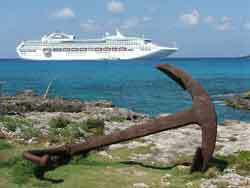 Cayman Island, - Arrived Sunday, anchored off shore, tender ashore, difficult transfer made easy by helpful crew. George Town quieter than normal, tourist shops open. Walked around, did some shopping, flat, mostly wheelchair friendly, tidy, prosperous looking town. Drinks expensive in Hard Rock Café but wheelchair accessible toilet available. No wheelchair friendly transport observed. Aruba - Docked alongside quay and main town of Oranjestad. Easy walk to shops. Hired taxi for 2hrs, US$100 tour of hilly island. Main rocky view points are not wheelchair accessible. Town flat and mostly wheelchair friendly. Lifts and wheelchair accessible toilets are available in two story Royal Shopping mall. Bonaire - Docked alongside quay and small town. Easy walk to limited local shops. Level walk along paved water front to local beaches. 45 minutes level walk to Bongos, Eden beach where we spent the day. 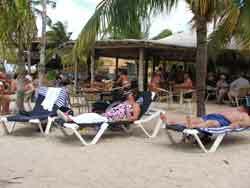 Bar, restaurant, beach beds and snorkeling equipment for hire. Good snorkeling, but not available to wheel chair users unless ambulant. We hired a taxi for the short ride back to town. La Guaira, Venezuela - Docked alongside quay and shanty town. It is only safe to go on organised tours. We remained on board put off by an hours drive to go anywhere. By a number of accounts, this was a wise decision. Grenada - Docked alongside the modern quay of the outside harbour in the shadow of Fort Frederick and close to the centre of the small town of Saint Georges. Range of tourist shops within the quay side buildings but we set out to walk to the botanical gardens via the inner small ship harbour. To leave the quay side requires a steep push over the hill to the inner harbour via uneven streets unless you risk walking through a narrow road tunnel. It was further than we thought and was not really worth the effort. We found a bar, had a beer and ordered a taxi for a 2 hour taxi tour to see some of the sights of this rugged island. A winding narrow road, very steep in places and full of hairpin bends took us to a waterfall and through tropical forest to the Grand Etang National Park where there is a lake in the crater of an extinct volcano. A difficult day with a wheelchair. Dominica - Docked alongside a quay away from the centre of the small town of Roseau rather than the town's quay which was occupied by another cruise ship. 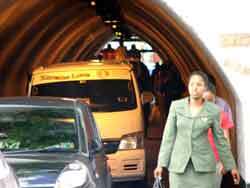 A US$2 per person shuttle bus service is available to take you into town but none are wheelchair friendly. The alternative is a level 20 minute walk. We found a mini bus where it was not too difficult to lift Wendy into the front passenger seat for the ride into town. Once there we walked to the nearby botanical gardens which were a little more impressive than those of Grenada’s Saint Georges. This is another rugged island and a wheelchair user cannot stray too far without encountering difficulties. We decided against a tour, found a nice hotel bar on the harbour front, had a drink on the terrace to cool off a bit before walking back to the ship. Barbados - Docked alongside quay about 1 mile from the centre of Bridgetown. The usual range of tourist shops greet you at the quay side and our first port of call was to the good tourist information centre where we picked up some brochures and maps and obtained a taxi price to visit Orchid World. After some bargaining we obtained one at the recommended price of US$80 return and we went there via Gun Hill. Orchid World was a little disappointing but it did have some nice flowers on display, a café and a good wheelchair accessible toilet although it was a hard push to get round the gardens pathways and hills. After rum punch we returned to our taxi. The likable driver offered to take us on an island tour for an additional US$20 which we accepted. We first went to visit one of the islands oldest churches, St Johns, which is perched 825ft above see level and offers splendid views of the area. This was quite wheelchair accessible and so was the next view point we were taken to which was complete with café/bar and wheelchair accessible toilets. At the end of the tour, we requested dropping of at a beach side wheelchair friendly hotel and found ourselves at the Tamarind Cove not far from Bridgetown for the remainder of our day. This hotel is listed as being suitable for a wheelchair but whilst access around the hotel is good it does not have any room or toilet adaptations although the public toilets did have a larger than normal cubicle. At the end of the day we caught another taxi back to the ship. Antigua - Docked alongside quay and the town of St Johns. 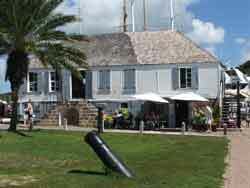 There is easy access to town but having been here before we had set our minds on visiting Nelson’s Dockyard. Several others also wanted to do this trip and we were soon organized with a mini bus at a cost of US$16 each return for the 30 mile journey across the island. The descent into English Harbour provided some excellent views but the views from Shirley Heights overlooking English Bay and Nelson’s Dockyard were stunning. However, the crowds and the terrain made these difficult to get to with a wheelchair. We spent a pleasant hour in the Dockyard before returning to the ship. It was not too difficult to get around but none of the buildings were wheelchair accessible and neither were any of the toilets. Tortola, BVI - Docked alongside quay and small town of Roadtown. Again we had previously toured this island so we were content to stroll around town with a refreshment stop at Pusser’s Pub where a couple of “Painkillers” (shots of Pussers rum on top of a local thick fruit cocktail) followed by a beer went down very well. Meandered back to the ship! St Thomas, US Virgin Islands, - Docked alongside quay 1-1/2 miles from the main town of Charlotte Amalie which was a US$4 per person taxi ride away. There is a closer quay but this was already occupied by three other cruise ships making the town very busy. The town has many shops, bars and cafes and is not too difficult to get around . After a morning of browsing we took a US$9 each return taxi ride to the wheelchair accessible 'Mountain Top' view point overlooking Magens Bay and the nearby islands. Here we took photos and had a light lunch washed down with a local banana cocktail. The site has a few tourist shops and a wheelchair accessible toilet. On our return to town we sampled the local beer and more Pussers rum before returning to the ship by taxi. Grand Turk - Docked alongside purpose built cruise quay for the afternoon where, over a flat area, there are shops, restaurants, bars, Margaritaville swimming pool complex, wheelchair accessible toilets and adjacent white accessible beaches. The islands small town of Cockburn is about 2 to 3 miles away. With two cruise ships in, the area was extremely busy and the beach crowded. We managed to find some seating in the shade by the pool and had a leisurely drink and a wander around the area before returning to the ship. Grand Turk was our last port of call and the next day was spent at sea, relaxing and packing whilst on our way back to Jamaica. We disembarked in the early afternoon and were taken the short journey to the airport by one of Ken's wheelchair friendly taxis. Boarding the plane was again to prove a frustrating experience and the plane was also 45 minutes late but with a bit of cheek we made it on board. With strong tail winds back we arrived at Gatwick at 0600hrs only 15 minutes late on a bright sunny Sunday morning. We were the last to disembark and I went and collected the car, returned to the airport to pick up Wendy and friends and we were on our way home two hours later.